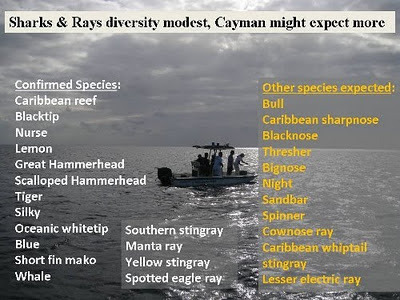 International marine scientists working in the Cayman Islands over the last few years studying local populations of mega marine fauna, in particular sharks and rays, have found far fewer species of sharks in local waters than they would have expected. Dr Mauvis Gore revealed that although researchers have counted sixteen different types of sharks and rays the scientists had expected to see more than a dozen other species in Cayman. Speaking at a special presentation hosted by the department of the environment, summarising their work the scientists said there was a strong case for Cayman to introduce protection for sharks in local waters. Dr Gore explained that shark populations are under tremendous pressure all over the world as a result of fishing driven by the fin and other shark product trades as well as for the flesh. Up to 73 million sharks are caught every year which is why “populations are collapsing” and at least 20 of the 360 species worldwide face extinction in the next five years. She explained that the loss of sharks threaten ocean eco-systems as these top predators help maintain healthy reefs. With no protection against shark fishing in Cayman it is not known how many are killed in local waters each year. “We just don’t have that information,” she added. Over the last three years the experts have not only been counting sharks but have also tagged some to track the movements of the various species and they found that larger species such as tiger sharks or oceanic white tips are covering considerable ground. This means that any fishing ban or sanctuary that Cayman establishes to try and save its sharks will require the co-operation of other countries in the region. Around the Caribbean so far Mexico, Honduras, the Bahamas and Florida have introduced bans on all or some species of shark fishing. Although the tracking has helped the scientists learn more about the sharks their failure to even find key species in the area to tag such as hammerheads has limited the research but so far the scientists are able to conclude that Cayman has only a modest number of sharks and a lower than expected variety of species. She also warned that because the sharks do not remain in the country’s marine parks. Dr Gore said the scarcity of hammerheads was a concern given that in the 1970s it was possible to sea schools of this type of shark in local waters. “People think I’m mad when I say this,” she said, given the current scarcity of the species here. Professor Rupert Ormond explained the studies that have been undertaken to demonstrate the economic value of sharks in the ocean versus being fished. He said that the consumptive value of sharks was around $1.6million a year while the tourism value when they are protected was as much as $60million. Researchers found around half of the fishermen in Cayman said they rarely or never fish sharks and few admitted to actually deliberately fishing them as most said they caught sharks by accident. Dr Ormond noted however with the lower than expected count there was a strong case for the Cayman Islands to introduce some form of sanctuary or protection and to try and work with neighbouring countries to introduce wider regional protections. He pointed out that mega marine fauna can bring in significant tourist dollars as there is enormous interest among visitors for swimming and diving among local shark species. Given the important of economics when it comes to persuading people to act to save species he said the case for the tourism dollar that could be generated from people willing to pay to see and swim with sharks and other mega marine fauna was persuasive. But Ormond also noted that a strong population of sharks denotes a healthy reefs and general marine and beach environments that are important to all visitors and residents alike. Mark Scotland the environment minister referred to the revelations by the scientists as “eye opening” when he spoke part way through the presentations stating that he was looking forward to hearing the recommendations of the scientists. The shark research is a major collaborative research project coordinated by the DoE between the Save Our Seas Foundation, Marine Conservation International and part funded by the UK’s Overseas Territory Environment Programme (OTEP) it has also been supported by local artist Guy Harvey and his foundation. More recently local beer makers, Caybrew, stepped in to offer financial help from the sales of their award winning beer named for the oceanic white tip. The brewery handed over a check for over $3300 to the DoE, at the event, after collecting 5 cents on every can of White Tip sold since the new beer was launched in the summer. Published by the Cayman News Service on Friday, January 6, 2011. This is very sad news indeed. I hope those fishermen who deliberately fish these sharks will be penalized. Looks like they do not care at all.